High-tech, lightweight and leading edge. Three-piece TR90 construction and design set a new standard for comfort and unobscured vision. 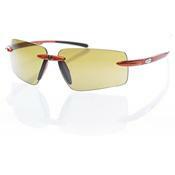 With patented Neox lens technology, the result is ultimate eyewear for the game of golf. Increased sun and wind protection for the shatterproof 8-base wrap lens.